Tottenham Hotspur striker Emmanuel Adebayor could be set for a return to Spain after reports from The People claim Atletico Madrid are interested in securing his services. Spurs brought the 28-year-old to White Hart Lane from Manchester City during the summer – impressed by Adebayor’s successful loan at the club under former manager Harry Redknapp. However, it is now understood that the player is looking for a move away from North London as he continues to be overlooked by new Spurs boss Andre Villas-Boas. Adebayor enjoyed a loan spell at Real Madrid two years ago and reports now suggest last season’s Europa League winners Atletico could move for the forward to replacement Colombian star Radamel Falcao – a player currently being heavily linked with a big-money move away from the Vicente Calderon. 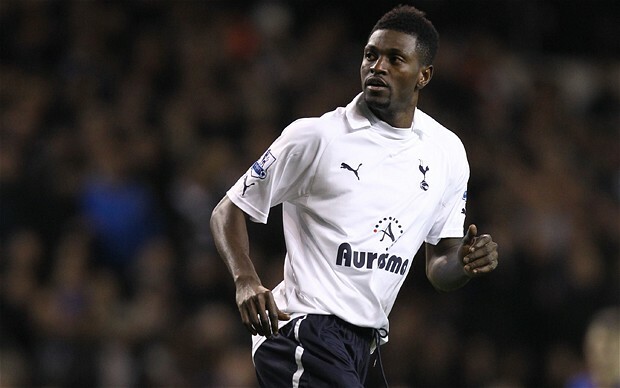 Former Arsenal player Adebayor took a pay cut to end the protracted move from City in August, returning to White Hart Lane on the back of a successful season-long loan during the 2011/12 campaign. The Togolese international has since found playing time difficult to come by, however, and is yet to start a game for Tottenham under Villas-Boas.